The Swiss National Bank warned investors that it had no restraints using negative interest rates in order to enforce the 1.20 EUR/CHF cap; the euro rallied against the Swiss franc as a result yesterday, and until now it is holding up to its gains. The euro is currently trading not far from its 3-week high against its Swiss counterpart, hit on Wednesday. The reason for the EUR/CHF rally was SNB’s official Thomas Moser’s interview for the Wall Street Journal. He stated that the central bank was determined to enforce the 1.20 cap against the euro. Moser also made clear that negative rates are an option in this respect. As of 3:55 London time, the EUR/CHF is trading at 1.2094. Immediate support is offered by the 1.2070 support, while the pair is expected to find resistance at 1.2116, yesterday’s high. The 1.20 cap was imposed in September 2011 after months of rapid appreciation of the Swiss franc at the time. In its fight against the growing risks of deflation and recession, the SNB promised to defend the level. After the ECB got markets by surprise by cutting interest rates to record lows on September 4 and detailed its plans to purchase asset-backed securities and covered bonds, the euro suffered against all major currencies, including the franc. 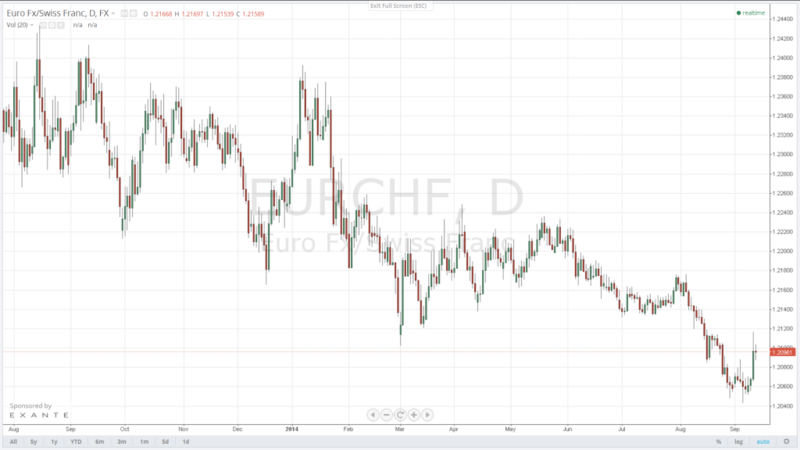 The same day, the EUR/CHF approached the cap, touching a low of 1.2043. The Swiss franc’s almost 0.9% gain against the euro in August prompted SNB’s policy makers to repeat their warning that they were committed to enforce the 1.20 level and stand ready to purchase unlimited amounts of foreign currency if needed. Earlier this month, the central bank’s President Thomas Jordan characterized the CHF as overvalued and stressed that maintaining the EUR/CHF cap is among the key aspects of keeping the monetary conditions in Switzerland adequate. The EUR/USD is continuing its consolidation between 1.2880 and 1.2960, staying above the 1.2857 low from Tuesday, but also unable to make a meaningful correction above the 1.30 resistance. The US dollar remains well bid with traders betting on an earlier than previously anticipated US interest rate hike. The Fed is on track to reduce its QE program by another $10 billion at its regular meeting scheduled for next week. Central bankers are expected to finish the entire program in October and commence with the rate hikes at some point in the first half of 2015.